creating a distributed collaborative adaptive sensor network that sample the atmosphere where and when end user needs are greatest. This system has the potential of having a profound impact on the society in terms of lives, property and the economy. A test bed is to be constructed on the island of Puerto Rico to verify the proposed DCAS solutions as applied to QPE. This test bed is being led by a multi-level, multi-institution team of students, ranging from Undergraduate to Ph.D. level, from a variety of scientific and engineering fields, located at the core CASA partner campuses. 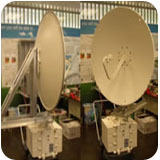 The test bed will follow parallel research paths utilizing off the shelf hardware to construct the network while developing a new type of low power radar. 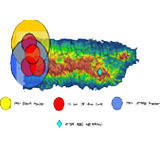 The test bed will focus on constructing a network of radars to provide detailed QPE to the people of Puerto Rico while educating students and advancing radar technology. Visit our test bed portal here.